In modern times, people have insatiable desire for something fashionable and innovative. Traditional transport vehicle could no longer keep up with the latest trend. 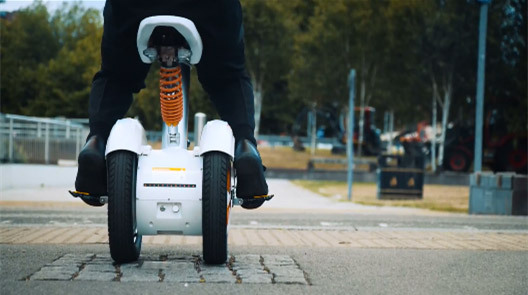 Airwheel self-balancing scooter creates a new fashion of commuting. With new design concept, Airwheel A3 makes riding safer and more comfortable. People are struggling with choosing a suitable and safe intelligent self-balancing scooter. Traditional electric self-balancing scooters require standing-posture riding which may cause fatigue. A3, with a saddle, resolves the trouble. The sitting posture makes long-distance riding possible. A3 is more powerful and the imported SONY battery has longer battery life. An electronic braking system is innovatively introduced to A3. When Riders push the electronic braking button, the vehicle will respond in 0.5 second. Then it will be stopped within 50 cm. This guarantees a safe riding experience. Airwheel electric self-balancing scooter A3 is a joint creation by industrial designers across the world. An original hydraulic suspension enhances riding stability. Unlike the heave electromobiles, A3 is light and handy. The automatic steering-sensor system, on the basis of the ergonomic design, abides by people’s thinking pattern and operating manner. The control shaft could be operated in the same way as car steering wheel. A3 doesn’t require too much learning, and users could ride as they sit on the product. 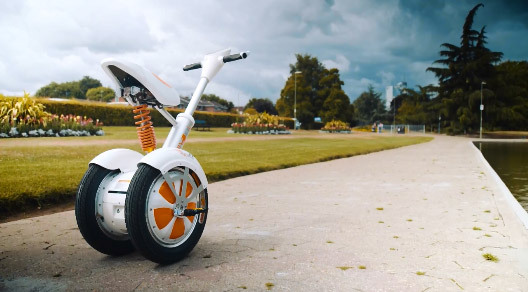 It is controlled by users’ body movement, like other electric self-balancing scooters. To deliver the best riding experience, Airwheel Technology has customized an APP for A3. Riders could get real-time data and calibrate A3 on their phones. As a complement to the commuting function, Airwheel has also enabled recreational, leisure, positioning, anti-theft and remote control functions. Airwheel Technology now intends to develop APPs for all its products. The rich features help to improve user’s handling experience. The unique designs generate unique fashion in the transportation field and the multi-function product satisfies all the requirements of modern customers. It is time to follow the unconventional path.